Ramat HaSharon, Israel, October 30, 2017. Israel Weapon Industries (IWI), an SK Group member – a leader in the production of combat-proven small arms for law enforcement agencies, governments, and armies around the world – is launching the 7.62X51mm caliber IWI TAVOR 7, the newest member of the successful TAVOR Bullpup Rifle Family. Adapted for military and law enforcement markets, it will be on display at Defense and Security Thailand, Milipol (Paris) France, and Expodefensa Colombia. The TAVOR 7 is a fully ambidextrous platform on which the ejection side and the charging handle can be switched quickly and easily from side to side by the user. The ambidextrous features include: safety lever, magazine release, and bolt catch similar to the X95. The IWI TAVOR 7 also includes an M-LOK fore-end (2 M-LOK slots at 3 and 9 o’clock) as well as MIL-STD 1913 Picatinny rail at the 6 o’clock position, to allow the use of multiple devices and accessories. The rifle’s body is built from high-strength, impact-modified polymer, and has a hammer-forged, chrome-lined, free-floating barrel for enhanced accuracy and life cycle. Additional features include a short stroke gas piston with a 4-position variable gas regulator, (including an OFF position – a unique feature designed for special operation needs), a rotating bolt system that ensures maximum safety for the user, and a pistol grip that can be changed or modified. The IWI TAVOR 7 enables 100% interchangeability, reducing maintenance costs. It is available in four colors: Sniper Gray, OD Green, Black, and Flat Dark Earth, with replaceable barrels available in two lengths – 17″ (432 mm) and 20″ (508 mm) – for various uses. The rifle has an overall length of 28.4″ (723 mm) and a weight without a magazine of 9lbs (4.1 Kg). The IWI TAVOR family of Assault Rifles is a line of versatile, innovative, and technologically advanced weapons. 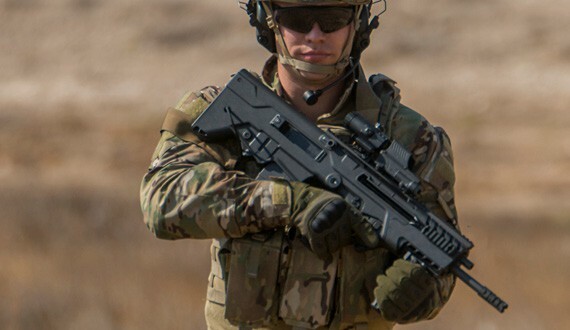 The TAVOR Assault Rifles have been extensively proven on the battlefield, performing with precision and reliability, and meeting the needs of human ergonomics. The TAVOR family was developed in close cooperation with the Israel Defense Forces (IDF), based on lessons learned from actual combat situations. Complying with the most stringent NATO standards for small arms – including environmental standards and harsh conditions – the TAVOR is in service in the IDF Infantry and Special Forces as well as in other countries throughout the world. It has a compact bullpup configuration, a barrel length and weapon size that cover all soldiers’ fighting ranges – from 500 meters to indoor operations, fighting from vehicles, urban areas, etc. Among its additional features, the TAVOR’s body is made of strong, modern composite materials, and its metal parts are corrosion-resistant. It can be comfortably used by either left or right-handed shooters.